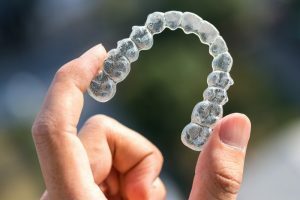 Why You Should Consider Invisalign® In Worthington in the New Year! Now that the new year is upon us, it’s time to start thinking about how you’re going to fulfil your new year resolutions! It’s a common resolution to improve your smile and oral health, but did you know that by pursuing a treatment like Invisalign in Worthington, you can accomplish both? The benefits clear aligner treatments like Invisalign have to offer are perfect for kicking off the new year. If you’d prefer to maintain your appearance while you begin your journey to a straighter smile and healthier you, keep reading! On average, traditional metal braces take a very long time to complete. That means for the next two to three years, you’re stuck with having a smile filled with distracting and inconvenient brackets and wires. For many, this reason alone is enough to deter them from seeking a straighter smile. Not only does Invisalign require less time overall to straighten teeth, but you can get your smile looking straighter by the time the new year roles around. Most Invisalign cases take anywhere from 6 months to a year to complete. While more complex cases may take up to 18 months, it’s still significantly shorter than what you’d have to settle for with traditional orthodontics. If you already didn’t like the way your teeth looked, braces aren’t going to do them any favors. The metal hardware is often associated with teenagers still in high school, which can put a damper on your professional image as an adult. The beauty of treatments like Invisalign is that your realignment procedure doesn’t have to be on full display as you complete it. Each tray is designed to be fully transparent, ensuring that only your smile is visible, not your realignment device. If you have an important event coming up, whether it’s a holiday party or a crucial business meeting, having the confidence to smile should be ready-at-hand! Of course, those that want to remove all doubt of anyone noticing your treatment can easily remove them for a short period of time, especially if they are posing for a photo. Oral Care: Easier During and After Treatment! As mentioned, Invisalign’s clear aligners are fully removable due to the nature of the treatment. But this function is also ideal for those who plan on building a new healthy diet filled with fruits, vegetables and other foods that can easily get stuck inside of orthodontic hardware. Invisalign clear aligners are meant to be removed when eating, so there’s no worry of damaging your treatment materials or limiting your new diet due to your hardware. Since your teeth will be straighter, this also means that food debris and plaque will have fewer spaces to get caught in. With less plaque and food buildup, you give yourself a much easier oral care routine overall. If you’re looking for a way to kill two birds with one stone this new year, Invisalign treatment with a dentist in Worthington is a great place to start! Schedule a consultation to learn more! Dr. Randall Nameth earned his DDS degree from Ohio State University. Thanks to his continuing education, he’s able to provide cutting edge dental technologies like Invisalign clear aligners at his office. To get started on your journey to a straighter smile or learn more about his practice, you can contact him through his website. Comments Off on Why You Should Consider Invisalign® In Worthington in the New Year!